Now that the weather outside is chilly, Florida manatees are migrating to warmer waters. They swim in search of a warm winter refuge such as freshwater springs or canals adjacent to power plant outflows. An adult manatee may weigh 1,000 pounds or more but is susceptible to cold. Water temperatures dipping to 68 degrees or below can produce cold stress in these aquatic mammals, and even cause death. 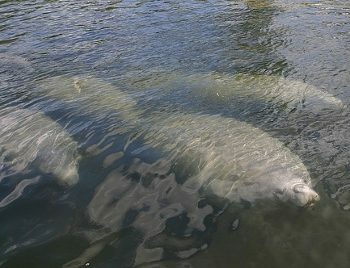 With many of the seasonal manatee protection zones going into effect on November 15, 2012, the Florida Fish and Wildlife Conservation Commission (FWC) cautions boaters to be vigilant about slowing down and watching out for manatees. In Broward County, some slow speed zones formerly active only on weekends are now in effect every day during the cold season. November is designated as Manatee Awareness Month because of this seasonal migration. How to spot Florida’s official marine mammal? Boaters and personal watercraft operators should scan the water near or in front of their vessels and look for signs that manatees are close by, including repetitive swirl patterns called a manatee footprint, a mud trail, or a snout or fluke (tail) breaking the water’s surface. Have someone help scan the water when under way. Besides following manatee-safety recommendations, people can help manatees survive by reporting sick, distressed, injured, orphaned or entangled manatees to the FWC’s Wildlife Alert hotline at 888-404-FWCC (3922) or text Tip@MyFWC.com. Florida residents also can call #FWC or *FWC via cell phone. Manatee conservation is supported by Floridians who purchase the state’s manatee license plate. Funds from this specialty tag go directly to manatee research and conservation. Copies of complete individual county waterway rules are available at www.flrules.org. Visit MyFWC.com/Manatee or call the FWC at 850-922-4330 for more information. Below are the manatee winter waterway speed zone changes by county, including the waterways where most speed zone changes occur in November. No-entry and motorboats-prohibited zones - North Indian River area around discharge canals of the Reliant Corp. Power Plant and Florida Power and Light’s Frontenac Power Plant. Idle-speed zone - West of Intracoastal Waterway in general vicinity of power plants. Idle speed - Port Everglades Power Plant area. Portions of the South New River Canal and Dania Cut-off Canal near the Lauderdale Power Plant. 25 mph - Lower (western) portions of Withlacoochee River and Bennetts Creek. 25 mph - Lower (western) portions of the Chassahowitzka River. Idle speed or slow speed - Portions of Kings Bay. Slow speed - Portions of the Homosassa River between the Salt River and Trade Winds Marina and southern portion of Halls River. Slow speed - All waters in the vicinity of the Florida Power Corp.’s effluent canal. No entry - Within the Blue Waters area of the upper Homosassa River near Homosassa Springs Wildlife State Park. No entry - Portions of the discharge canal of the TECO Power Plant in Apollo Beach. Idle speed - General vicinity of the TECO Power Plant in Apollo Beach. Slow speed - Within Sand and Shell islands area, Channel Marker 66 south to Channel Marker 75; Indian River area from Hobert Lodge Marina to North Canal; and from Channel Marker 156 south to St. Lucie County line west of the Intracoastal Waterway. No entry - Discharge and intake canals of the Florida Power & Light Tice Power Plant. Idle speed and slow speed - Portions of the Intracoastal Waterway channel on the Caloosahatchee River in the vicinity of the Tice Power Plant. 25 mph - Portions of Estero Bay, Hurricane Bay, Hell Peckney Bay and Hendry Creek. Seasonally unregulated - Cayo Costa, North Captiva, Captiva and St. James City areas. No entry - Portions of the Biscayne Canal, Little River and Coral Gables Canal. Slow speed - Within portions of Meloy (or East) Channel and portions of the Intracoastal Waterway in Dumfoundling Bay and Biscayne Bay between Broad Causeway and Venetian Causeway. Motorboats prohibited - Within general vicinity of Florida Power & Light Riviera Beach Power Plant discharge canals. Slow speed - Outside the main channel in the Loxahatchee River, and in the north and southwest forks of the Loxahatchee River. Idle speed and slow speed - Look for shore-to-shore speed zone changes north and south of Peanut Island near the Florida Power & Light Riviera Beach Power Plant. 25 mph - Portions of the Intracoastal Waterway channel between State Road 706 and Lake Worth, and south of Lake Worth to Broward County. No entry - Portion of Salt Creek and Warm Mineral Springs north of U.S. 41. Slow speed - Within Garfield Cut/Fish House Cove area. Slow speed - Within Intracoastal Waterway channel between North Beach Causeway south to Channel Marker 189 and within the Shark Cut Channel in the Fort Pierce Inlet area. 25 mph - Portions of the Tomoka River and Spruce Creek. Motorboats prohibited - Blue Spring Run. Slow speed - St. Johns River, south of Lake Beresford to Channel Marker 67. Copies of complete individual county waterway rules for protection zones are available at www.flrules.org, or visit MyFWC.com/Manatee, or call the FWC at 850-922-4330.